I like use the time tracking application, it can record my important transition and my new begin. 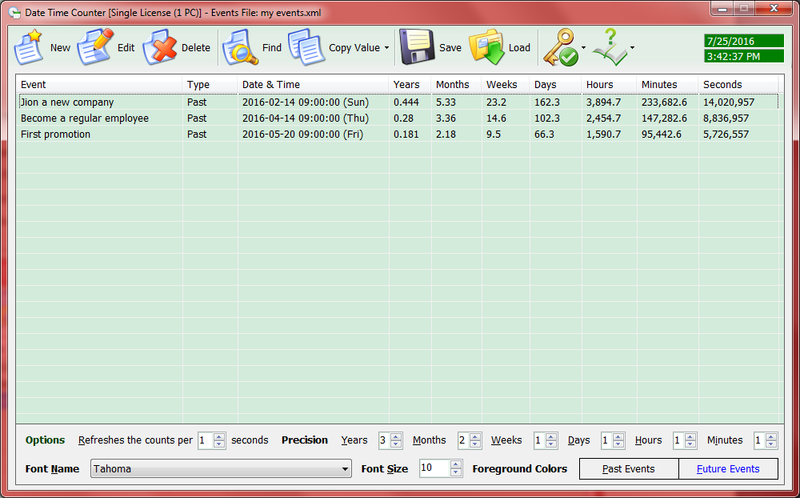 I can get the easy time tracking software and check any time as long as I have recorded. I record my first join in my company, and the time I become the regular employee, also I record the time for my first promotion. These are all my big events in my life, and this time tracking software tracks the time for me, so I can check regularly and encourage myself to work harder. Here is my list I recorded in this year. It’s an easy time tracking software to check every step I have made in this company. And I like share the time table with my friends, they use the same time tracking software. We will copy the years, months or the days we have worked, (choose the data and click "Copy Value -> Days" or press <Shift+F7> to copy the days your event has spent) and exchange the data, by doing that, we can be informed by their big events and we feel happy for their promotions, and we can encourage ourselves. Or I will copy the results and sent them to my parents, they care about me, so I like telling them every important moment in my life and share the joy with them. Get the best time tracking program now!